Speaking to reporters ahead of his talks with Egyptian counterpart Abdel Fattah al-Sisi in Washington on Tuesday, US President Donald Trump specifically mentioned his spouse Melania’s visit to Egypt in October 2018, during which she, in particular, enjoyed the sightseeing of the pyramids. “She thought it was incredible. She thought it was one of the most incredible things she’s seen. And we have lots of pictures, and that was great day and a great moment to see the Pyramids — the Great Pyramids”, Trump added. — Melania Trump (@FLOTUS) 12 октября 2018 г. 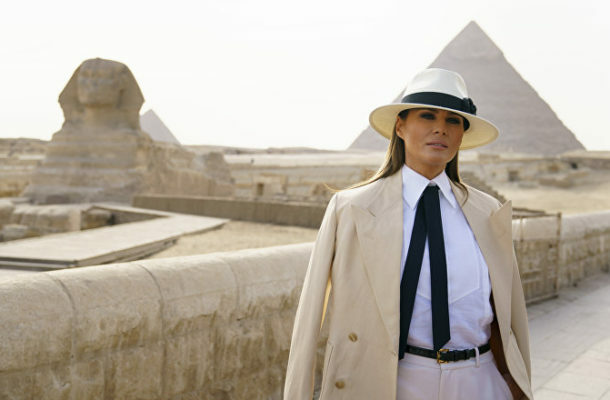 He expressed hope that “a lot of people will be going and looking” at the Pyramids, reiterating that Melania was “not easily impressed; she was very impressed”. — Egypt Built (@HosamDakhakhni) 6 октября 2018 г. Separately, Trump underscored that “we've never had a better relationship, Egypt and the United States, than we do right now”, adding that he and Sisi would discuss military and trade during the White House meeting.